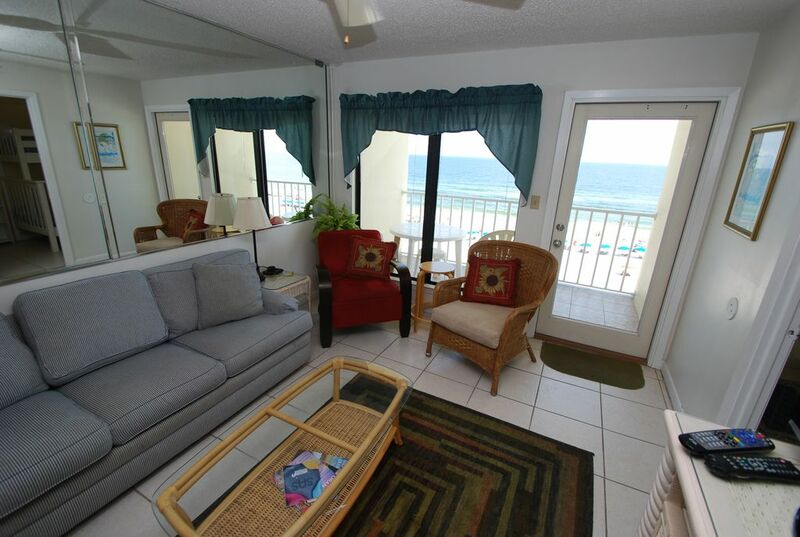 Enjoy one of Gulf Shores' most popular and affordable rentals in a low density complex. This 6th floor unit offers a breathtaking direct gulf front view of the Gulf of Mexico, beautiful white sandy beaches, and great access to shopping, movies, and other activities. Updated two bedroom/two bath condo has full kitchen, washer/dryer, convertible bed for additional guests, and free WiFi. The master bedroom has a brand new king size bed and private bath, with new flat screen TV and DVD player. The second bedroom is located off of the living room and now accommodates three with a new bunk bed unit - lower is double and upper is twin. Great for families with three children! New living room furniture and a new flat screen TV and DVD player provide a nice place to relax with a movie, a book, or even a nap! Beach front balcony includes patio table and chairs. The complex has a big swimming pool with ample lounge and patio seating. Island Shores is situated in a prime location with just a short distance to three large grocery stores, four pharmacies, an ABC store, restaurants, movie rentals, spas, and shopping. The Tanger Outlet Mall offers great retail therapy with over 120 brand name stores for those occasional rainy afternoons. Take a dolphin cruise from the Wharf, which also has an amphitheater for regularly scheduled concerts, more shopping, and a movie theater. Perdido Pass in nearby Orange Beach offers a new area just for fishermen. Marinas, glass bottom boats, chartered deep sea fishing, golf (big boy and miniature), Alabama Birding Trail, amusement parks, and water theme parks are all just a few short minutes away. If you are looking for a romantic getaway, a family retreat, or respite from the everyday hustle and bustle, you will love our condominium at Island Shores as your next vacation choice. We assure you there will be no disappointments! We will strive to make your stay comfortable, stress free, and memorable. We look forward to establishing many long standing relationships. Looking for something a little larger? Try our 3BR/3BA condo in Orange Beach - VRBO #205186! Oceanfront end unit with wrap around balcony providing oceanfront view and balcony access from each room. We are very motivated to book your next vacation! Give us a call now!! Quoted price includes a single Parking Pass. Up to one additional Parking Pass may be purchased upon arrival or by contacting the office directly. This property needs updating. The master bedroom mattress provides no support, seems old. A couple of lamps did not work even after switching out the bulbs. The toilet in the 2nd bathroom ran constantly, the ceiling fan in the master makes noise when turned on, the master tub drains oh so slowly. And the living room could use one less chair since it's a smaller unit; i's too cramped. Fortunately, the elevator was working, albeit slow at times. The view was spectacular, the people were wonderful and the beach was great. I informed management of the maintenance issues; they were very nice. The unit needs some investment from it's owners. Thrilled to hear you enjoyed your vacation and the view. We appreciate all feedback and have passed your suggestions along to the owner for future updates. We have corrected the maintenance issues that you identified for us so they should be no issue for future guests. We hope to see you back again soon for another fun filled vacation. Very accommodating and awesome location! Love hearing that you arrived to an exceptionally clean condo, as we strive to be the best in what we do. We also love hearing that you enjoyed your vacation in spite of the minor setback with the elevator. We were unaware of the issue until you reported it to us, as the association for the building forgot to contact us and report the issue. We hope to see you again soon to enjoy some more time here in paradise! Beautiful view with a bonus...washer and dryer!! We had a wonderful time staying in Golfshores. The condo was great although it was a little outdated for my style. The washer and dryer are a bonus for sure! The only problem I had was the fact that it was on the six floor and the elevator would take for ever or even sometimes not work at all. The ventilation in the master bathroom seemed to not work so well and the actual showerhead was not held tightly to the wall. But all minir problems. The pool was fantastic and so was the beach! Definitley will stay again for sure! So pleased to hear that you enjoyed your stay. We are sorry to hear about the problem with the elevators, and we have forwarded the concerns to the buildings association as they are in charge of maintenance on the common areas. We have maintenance looking into the other issues you mentioned and hope to have them fixed soon. Hope to see you back again soon for another great stay with us here in Gulf Shores!! Great location but it needs newer furniture and the elevator needs maintenance. The view is outstanding! I sat on the balcony, drinking my morning coffee, and watched the dolphins. The dolphins swam by around 7 o'clock. It's a 1/2 mile walk to the Hangout, not too bad. The elevator is very slow and sometimes doesn't work at all. This was the first time that my husband and I have stayed on the East Beach, as we usually have stayed on the West Beach but we had a wonderful experience. It was so convienent to everything, especially Sea and Suds for a quick lunch. BIG bonus was the washer and dryer in the unit. Condo was nicely decorated and very clean, had everything we needed. TJ at Poole and Associates worked with the owner to get us into this unit at literally the last minute after there was a problem with a unit we had previously booked and we could not have been more pleased. Great view of the beach/ocean with a relaxing balcony. Would definately recommend this unit to other guests and hope that we can stay again in the not too distant future.